Around June 2011 a friend of mine (let’s call him Glen, since that’s his name, and he may often make an appearance on this blog) told me about a book that he was reading, ‘The Diet Delusion‘. It sounded interesting, so I bought it, and was amazed by what I read in the first few chapters. I won’t go into details here, suffice it say that the author dismantles, with the help of an astonishing array of references, many of the ‘sacred cows’ of healthy eating that I had believed in for years (the book is pretty dense, for a summary you can watch this video). ‘The Primal Blueprint’ is the manifesto of Mark (‘s Daily Apple) Sissons, and became my guide to applying the information of “The Diet Delusion’ to my life. The blurb on the cover offers “…effortless weight loss, vibrant health, and boundless energy”, and Sissons is very clear that the Primal Blueprint concept is not a diet, but a lifestyle. Nutrition is a significant slice of the Primal pie, but exercise, sleep and sun also play a part. I didn’t start reading either of these books thinking that I needed to lose weight, but I certainly knew that I ate more sugar than was good for me, and had had a nutritionist point out to me that my diet was dominated by wheat. My daily food might look something like: toast and jam for breakfast; pain au chocolat and perhaps a croissant too during the morning; sandwich, with fruit, and probably chocolate for lunch; muffin/brownie/chocolate coated peanuts and maybe more fruit afternoon snack; and pasta or pizza for dinner. On the whole I considered myself to be reasonably fit and healthy (on reflection I may be very lucky with my genes…) and I knew that cutting back on sugar was very difficult for me. The transformation in my eating began, as I learned about the role of carbohydrate in fat storage, with trying to increase my protein intake – opting for sausage and egg croissant instead of the pain au chocolat, for example. The more I read (and one of the things I enjoy about the Primal/paleo community is how much information people offer for free), the more I started to believe that eating grains was a bad idea, and with that I found it surprisingly easy to cut back on my wheat consumption. The shift in my eating probably took four or five months, and was amazingly easy. At first it was very difficult to find ‘primal’ snacks when I was out of the house but as my eating changed more I discovered that I don’t need snacks – four to five hours without food is perfectly manageable if you’re not carbohydrate dependent. A year ago I could easily eat an entire bar of Green & Black’s creamy milk chocolate (36% fat, 50% carbohydrate) – I might have felt a bit sick afterwards, but that wouldn’t have stopped me. Now I find one square of milk chocolate a) doesn’t taste of chocolate at all and b) is so sweet I can hardly bear it. At the same time Lindt 90% cocoa dark chocolate (55% fat, 14% carbohydrate) tastes truly wonderful. 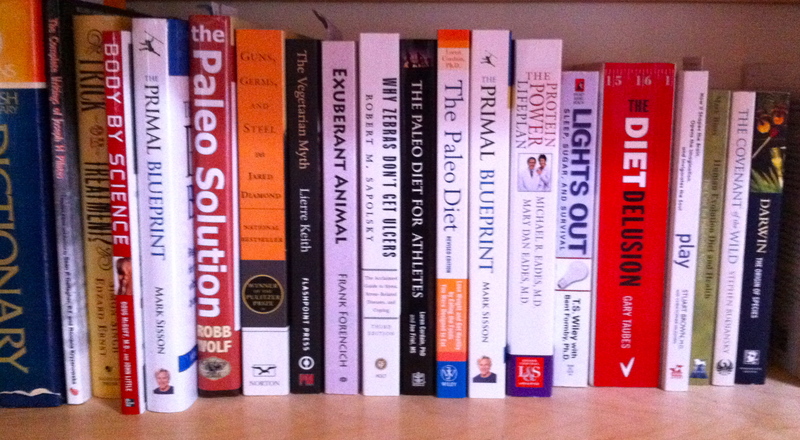 As I mentioned earlier, ‘The Primal Blueprint’ isn’t just a diet book, so what else is there? 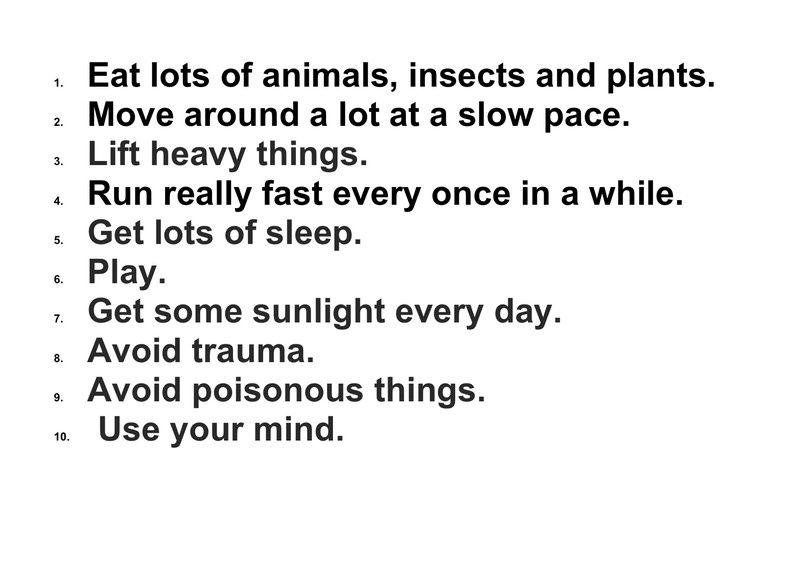 These are the 10 Primal Blueprint Laws. Some may need a bit of elucidation: ‘avoid trauma’ in an earlier edition of the book was ‘avoid stupid mistakes’, and is essentially to do with being more conscious of one’s environment, so as not to get hurt; ‘avoid poisonous things’ largely refers to eating foods that contain anti-predation chemicals/elements that we’re not made to digest – these would include almost all grains and legumes (I’m not the ideal person to explain why – please click on the links for Sisson’s own explanation). I’ve not done so well with the insect eating, lots of sleep is sometimes tricky (especially when living with an excitable kitten…), and I don’t play as much as I might, but on the whole it’s been a very positive experience trying to stick to them. In fact, the changes to the way I eat, and approach exercise have led to one of the biggest transformations of my life. Pilates definitely had a hugely transformative effect on me – it freed me from 18 months or so of chronic pain, and opened the door to the first real career that I’d ever wanted (and I met my wife through Pilates). It’s inspired me to learn, and allowed me the chance to be a part of running a thriving business. Probably because of my nature, Pilates also allowed me to have a somewhat entrenched view of ‘proper’, or worthwhile exercise, and a limited perspective on physical health. (Let’s be clear, these are my shortcomings. Please see my earlier post for more thoughts about Pilates and health). And how has the Primal lifestyle transformed me? I’ve lost body fat (I had no idea I stored so much fat in my legs…); I feel like I have more energy; I’m stronger; my eczema is a thing of the past; I don’t feel bloated after eating; I’m less gassy, and my digestion from (ahem) start to finish is generally better. The weightlifting appears to have made me more flexible, and has also made me work some muscles much more than I’d managed previously – I’d never felt my back extensors work like they have to when I squat properly. I’ve also learned that activities like weight lifting have more in common with Pilates than I might have imagined – the language and the application is different but you still have to work from your centre, and the load is supported from your centre. Physical things aside, there are plenty of other benefits. I’ve discovered that I really enjoy cooking, and, better still, the pleasure of cooking for friends and family who appreciate the food. I’ve developed a relationship with some of the people that I buy food from, and get a surprising kick from the whole process of eating, from the buying of fresh ingredients to the preparation and cooking (no more ready meals in our house…). As well as taking up weight-lifting and other high intensity exercise, I’ve also been introduced to other approaches to exercise/movement like MovNat and Exuberant Animal (see ‘Useful Links’), that I’m really excited to be learning more about. My inspiration to learn is greater than it has been in a long time, and I’m optimistic that I will be able to offer more to my clients over the coming years as a result. I’ve been led toward quite diverse reading material that has helped me to reframe thoughts about a variety of subjects, and to be more considerate of how my actions effect my immediate environment, and the larger world. In the same way that we try to encourage clients at our Pilates studio to feel responsible for their health and well-being, the primal lifestyle really fosters personal responsibility that, in turn, encourages a positive outlook. If I believe that I’m in charge of my health, and I’m making sensible choices to support it, then I can feel optimistic about remaining healthy, fit and strong as I get older. 2 responses to Why go Primal? I’m glad you explained a bit about this as after reading your last blog I wasn’t sure what you were talking about ; Paleo / Primal and I didn’t refer to previous blogs, lack of time, as I’m sure I would have been enlightened! So I feel a bit more informed. I haven’t read any of the books you mention so I may well find the answer to my question in the books, but since you’ve already read them, maybe you can pass on your wisdom. Since we are constantly told that we should only have red meat once a week and that the fat on the said red meat collects around our major organs and arteries, thus causing potential heart problems etc; what is your take on this? Have we been misled? Do any of these books have recipes? Or is it more about white meat & fish? I have to acknowledge that my wife suggested that I should explain the prima/paleo thing a bit more, rather than assuming that everyone’s got time to follow links/read books etc. The non-biochemist explanation that I can offer is that grain-fed meat is not ideal (definitely not ideal for the animals, as they are have digestive systems for grass, not grains), since it is likely to contain some of the allergenic/inflammatory elements that the grains themselves contain. The fat of grain-fed meat is likely to be the repository for those ‘anti-nutrients’, so if you don’t know how the meat has been reared then lean meat may be a better option. Otherwise, my understanding is that there are no studies that have shown that animal fat has anything other than a positive effect on our longevity – and there have been many attempts to try to show that it is harmful. As to the dangers of red meat, the studies, including the one that was all over the press a few days ago, that ‘show’ that red meat causes cancer/heart disease etc etc are not worth the paper that they are written on. Firstly, this was an observational study, useful for forming hypotheses that could then be the subject of controlled experiments – in terms of evidence it’s about as useful as the graph that shows that the Greek debt crisis has a very strong correlation to the rise in Facebook users. The data was collected from those 120,000 participants via FFQ’s – food frequency questionnaires – requiring that, once every four years they recall what they’ve eaten for the previous four years…..Doesn’t sound very reliable, huh? There aren’t any studies that have been reported in that show a mechanism by which meat is bad for us – and you can bet that we’d hear about it if such a thing existed. This leads me to conclude that there is no reliable evidence to support those claims. The evolutionary perspective often used in the paleo-sphere is that we ate meat as hunter-gatherers for a couple of million years, without any trace from archeological records of degenerative disease, cancer and so forth. These diseases only crop up after the advent of agriculture and processing of food. Similarly, in the few modern hunter-gatherer societies that have been studied, the ‘diseases of civilisation’ only appear when people start adopting ‘modern’ foods. Thanks for asking, and apologies for the long answer.